I didn’t pick up this book, my friend did. She was visiting New York last February and took the opportunity to haul back a few small prints—titles that wouldn’t have found their way to the Netherlands on their own. 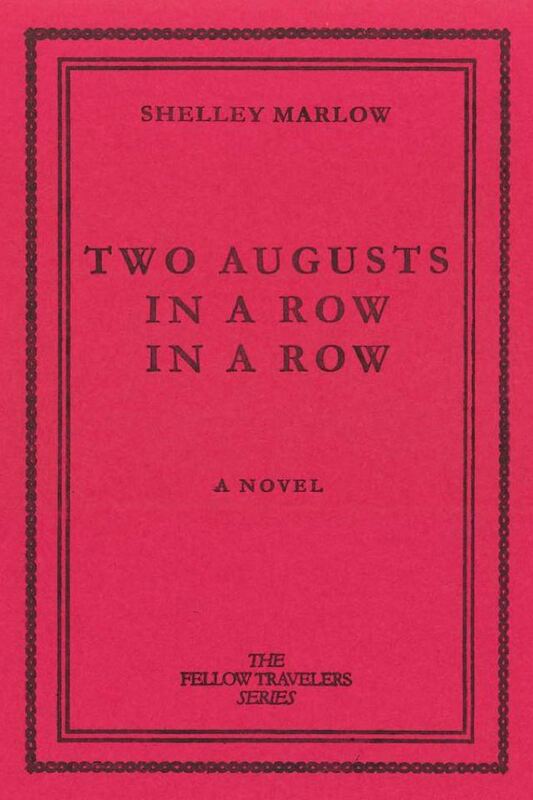 Shelley Marlow’s Two Augusts in a Row in a Row initially ended up in her stack for aesthetic reasons: it’s magical looking, a small red book, with a title like a poem. The way she explained it was that after already having decided to get it she paged through the work, saw the words “Naples” and “witches” and then spent the rest of the day reading the novel from cover to cover. She texted me about it during her visit. On the day of her return, jetlagged, she pushed it into my hands and said you have to read this. I said no I couldn’t, not right now, I had a million other books to finish and review and, and and and. She tried again the next week, and the month after, and in the end it took me going away for work for to say: allé, give it, I’ll read it while I’m gone. You’ll enjoy it, she said again. It has everything you like. Friends: it did, in fact, have everything I like. What an understatement of a sentence. Two Augusts in a Row in a Row follows Philip over a segmented period of their life. Philip is a drag king, Philip is Jewish, Philip is a witch, Philip used to be Philomena, Philip has a cat called Faye who is darling and who sometimes writes letters to her cat-friend in Norway (an orange tabby called Pumpkin). The story is set in early 00’s New York, travels through Boston and then Naples and then back again. The lines that draw Philip from place to place are achingly realistic: friendships that bleed over into romances, romances that bleed out to nothing—family, chatrooms, a friend of a friend who made a promise about a movie script they kind of want you to write but have no money to produce. I’ve rarely seen romance written this way, this close to what it feels like—confusing, lurching in progress, and often over as quickly and intensely as it started. There’s one chapter that I loved, where a woman called Nettle falls for Philip after seeing them sing on stage. She starts by asking if Philip wants to hang out, and when they say yes, what does she have in mind, Nettle says, How about you hang out with me for seventeen years? And Philip says yes, (and I said “yes,” too, at the book, out loud), and they go on a few dates, but it’s clear that Nettle has a whole story of her own, a narrative that has nothing to do with Philip. She cries, thinks they’re too cool for her, too nice to her, and eventually breaks up with Philip in the middle of a party saying, I lost myself in you. I can’t. I can’t see you ever again. Philip, in contrast, recounts the whole relationship in between lines about their cat, about friends, over the course of about three pages. And so it goes: we are all someone’s Nettle, and we are all someone’s Philip. Bumping into one another with whatever story we’ve made of the other in our heads. Two Augusts in a Row in a Row is not about anything in particular anymore than any given person’s life is about anything in particular. Characters are introduced in an almost Platonian way, often asking questions devised by the narrator to introduce a train of thought or some history—and I liked this humorous reclaiming of a literary device that, to me, has often seemed like the epitome of patriarchal writing. Sometimes reality as most of us know it flits out the window and there’s people levitating, there’s hallucinations and visions. At other times suddenly the writing takes a modernist turn and the characters get angry over something unclear, feel a feeling and express it loudly while standing at a window, hands in their pockets. Calling it a novel—though that’s what it says on the tin—feels like either selling the work itself short, or paying a grand compliment to the very notion of a novel. But then again, sometimes the work reads like a journal or maybe a very long postcard, sentences cut short but delivered with the thrill of someone on vacation: James, Jon and his wife are here! We exchange gifts in the living room, with the velvet couch and all of the family photo albums. Everyone gets nice knit Irish socks from James. And isn’t that one of the earliest forms of novel-writing? A work that blurred the borders between reality and fiction in the form of a journal or a letter? So I take it back, let me phrase it like this: calling Marlow’s work a novel is a true thing, an act of return. I called my friend (who, by the way, is also an editor) yesterday to talk about the story. I said, I always think I’ve seen all the new strange things books can do and then I read something like this and I realize I know nothing. Her reply to this, and I am quoting her with permission, was: everything about it surprised me about this. And every time I thought, ‘would I edit this differently?’ I also didn’t know how to—which I also feel is the point of queer writing. To have something feel queer and not want to change it into something normative. And because my friend is brilliant, and because she was the one who insisted I read this book—and I’m so glad she did—I will let the above words close this one off. Best read: underway, in the sun, in August, nearby a cat. Out loud, to a cat. Not while eating, because the cover is sensitive to sticky fingers.